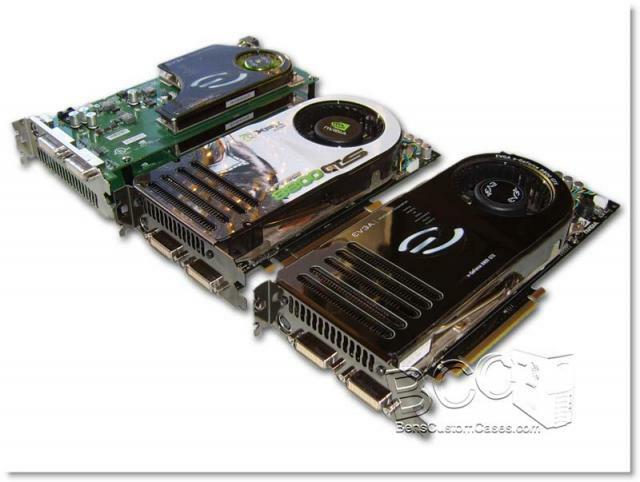 In the second quarter of 2006, nVidia released the 7950GX2 video card in order to stay ahead of ATI in terms of "single card" performance. What this dual GPU card offered was hardware SLI on one board and the ability to link two of these cards together in an additional SLI link for a Quad SLI configuration. While the sound of this excited many people, real world performance numbers didn't show much improvement over SLI and in some cases performance was worse. This was a valiant attempt by nVidia to utterly destroy ATi, but it didn't work quite as well as they'd hoped. The truth is, the 7950GX2 was the single fastest graphics card on the market until the launch of the 8800 Series of graphics cards from nVidia. nVidia has done some impressive changes on this new generation of graphics cards, and while they are not clocked much higher than previous graphics cards, performance has improved significantly. Today we are going to take a look at two different series of graphics cards from nVidia that have been released in the same calendar year and see how much more performance the 8800GTS and 8800GTX offer above and beyond the 7950GX2 Powerhouse. We will be testing all of the cards on a fresh install of Windows XP Pro 32-bit under DirectX 9. The 8800 Series offers DX10 functionality, but we don't have a final DX10 Operating system as of yet, nor do we have drivers for the 8800 Series that work under Vista. Perhaps in the future we will be able to revisit this review and run DirectX 10 performance on the cards. Below is a list of features and technology that the 8800 Series offers. Delivers up to 2x the performance of a single graphics card configuration for unequaled gaming experiences by allowing two graphics cards to run in parallel. The must-have feature for performance PCI Express® graphics, SLI dramatically scales performance on today's hottest games. NVIDIA's fourth-generation GPU architecture built for Windows Vista gives users the best possible experience with the Windows Aero 3D graphical user interface, included in the upcoming operating system (OS) from Microsoft. On the next page we'll take a look at the cards and get this showdown rolling.